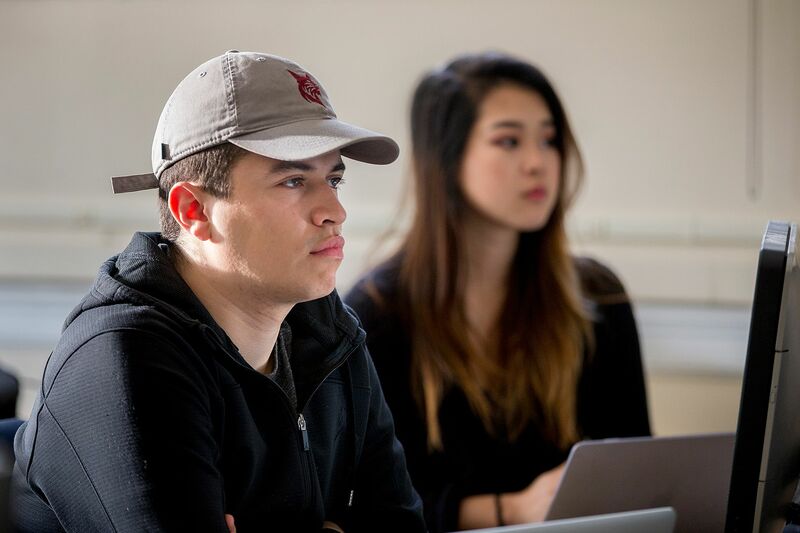 In a Coram computer lab on May 3, a dozen or more students are evaluating long lists of keywords — words that they might or might not use as they craft copy for a digital ad campaign using Google AdWords. 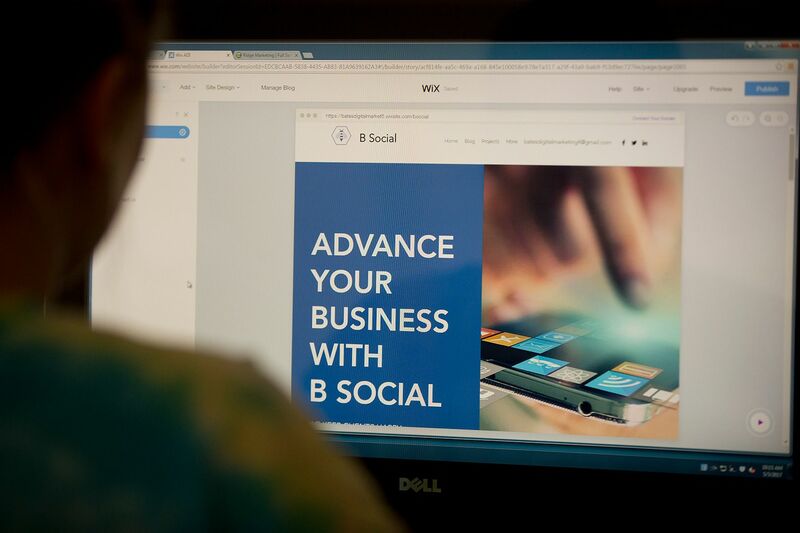 AdWords enable businesses to place those ads that appear at the top of Google search results. In seriously oversimplified terms, advertisers pay for keywords in their ads. So on this day in Coram, the students are learning how to choose the keywords that will give them the biggest bang from a limited budget. 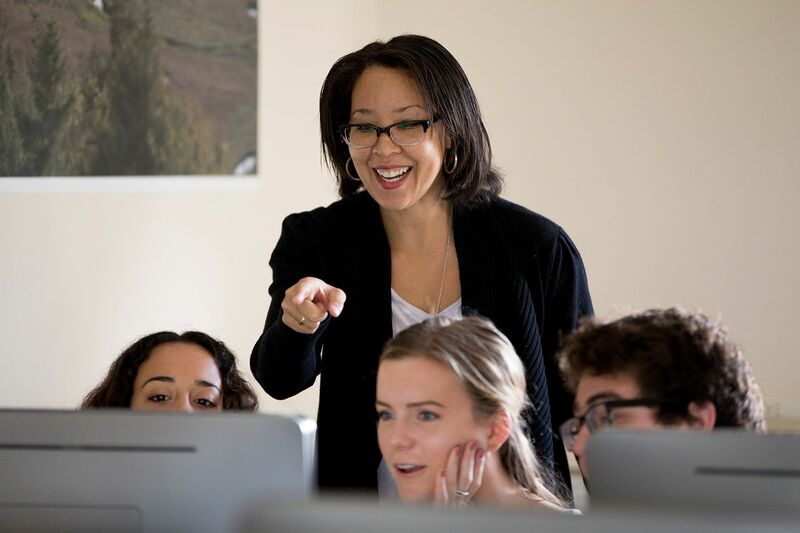 Michelle E. Ashley Hart ’91, a digital marketing consultant, is guiding the students through their first foray into online advertising. Hart is teaching a Practitioner Taught Course on digital marketing, offered under the auspices of the college’s Purposeful Work initiative. Doing business as Ashley Hart Marketing, this Manhattan-based consultant has more than 25 years of marketing and branding experience, specializing in the digital realm. Hart has strategized for companies ranging from startups all the way up to Fortune 500s listees like Morgan Stanley and Infor, and for nine years has been the marketing advisor to the private equity firm Insight Venture Partners and 45 of its portfolio companies. 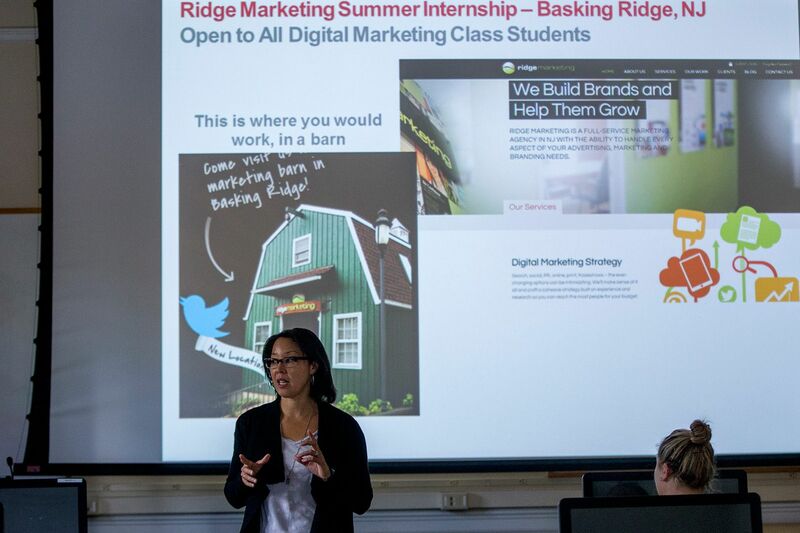 Hart’s students at Bates have formed fictional agencies that specialize in digital marketing segments such as product marketing, social media, branding, and millennial audience targeting. They’ve published websites for fictional businesses, and the ad campaigns they’re now creating are meant to drive traffic to those businesses, creating metrics they will then learn to assess. Hart talks with newswriter Doug Hubley about her time as a Bates student, her return to teach for Short Term, her dedication to marketing — and how she discovered that passion as a member of the Chase Hall Committee. I love everything about marketing. To me, marketing is both the left and the right sides of the brain: You’re doing the creative side with writing and design, but then you’re also evaluating the success of campaigns through analyzing data, which uses the other part of the brain. I’m a big proof-of-concept person, and metrics really give me that advantage that I did not have prior to Google’s being able to provide customer data. effectiveness based on how many people shopped at the store the day after the commercial. Now I launch an ad in a digital channel, and when somebody clicks on that ad and takes action at my website, I can track that user and analyze whether the ad’s successful. What led you into marketing? I worked on the Chase Hall Committee, which brings entertainment to the school. And I loved it. I loved doing the events, and making the posters and all those things. And then I realized that was marketing! 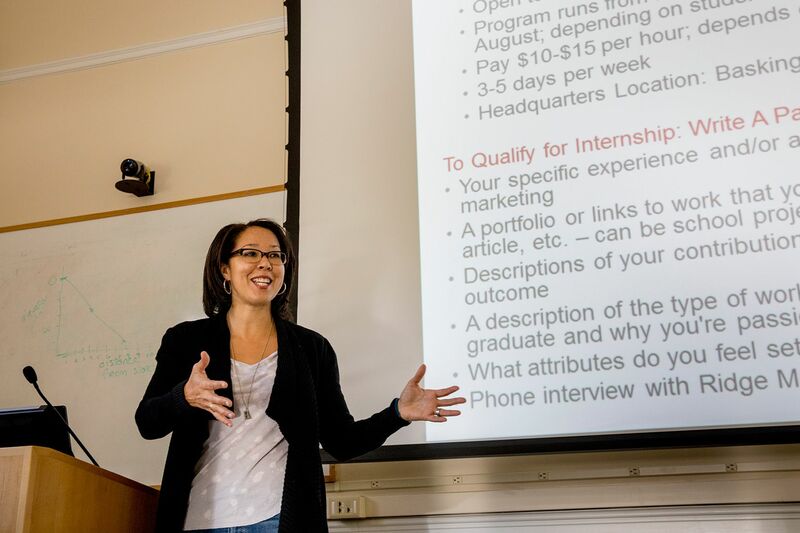 A lot of my students have good potential to succeed in this field, which is why I’ve arranged paid summer internships for four of them with my clients and partners. internship at Lehman Brothers in Boston, so I could get a job as an assistant in sales at a Wall Street investment banking firm, Kidder, Peabody & Co. Then a new position came up at headquarters in marketing. In a way, that set my career direction, because it was a new position and it was entrepreneurial — a marketing coordinator to work with analysts covering the burgeoning high-tech field. It was great. It was the beginning of the digital revolution, and I was able to learn a lot about that, along with the entrepreneurial skills of the new position. And it allowed me to expand on what I had learned in the Chase Hall Committee in a real business setting, managing events for the tech analysts. What’s the scope of your Short Term course? I can’t get into the deep levels of digital marketing in the course because there’s so much of it. But what I can do is prepare students to understand how companies use digital marketing, what tools digital marketers use, what buyers want, and how we measure success. They’re learning everything that a typical marketer would know in creating a digital marketing campaign. I’m also helping the students build a digital marketing portfolio, so that when they walk out the door — whatever business they want to go into — they’ll be able to show their portfolio as proof of their abilities. That alone is a big deal, since it’s a collection of all of the marketing work that they’ve produced in the class. Instead of just showing case studies, I wanted this class to be interactive. That’s where these Practitioner Taught Courses are great. My students are all really acting as digital marketers and learning. And I think a lot of them have good potential to succeed in this field, which is why I’ve arranged paid summer internships for four of the students with my clients and partners. What have you learned from teaching this course? There’s something about seeing somebody “get it” — you can tell from thoughtful answers that they’re coming up with that, maybe, I’ve helped them in some small way to figure out what they want to do. I’ve learned that I really enjoy passing along my experience to my students and that hopefully, they will surpass me in their success. How was your Bates experience? Honestly, it was culturally shocking, coming from the New York City area. It took, I would say, my freshman year to get adjusted. But I had great friends, I learned a lot, and ultimately, I would have never chosen any other place to be. Bates made me who I am today and gave me the critical thinking that I needed to go into marketing. So, ultimately, it was the best choice for me. I went to Columbia University for a summer, just to compare, and I didn’t like the experience of going to such a large school, even though I was from that area. I liked that I was in the heart of New York City and having all this great cultural experience, but I wound up missing the intimacy of Bates. Why did you want to teach this course at Bates? As an immigrant from Jamaica, and coming from a working class background, I got the opportunity to achieve the American dream from Bates. What are some impressions of today’s Bates? I am very happy to see how diverse the school has become. Like I said, the hard part my first year here was the lack of cultural diversity, and to literally see it everywhere around me now — it’s really refreshingly nice. I was very happy to see this evolution. I ran into Dean James Reese, who was my dean when I was a student here, and probably one of the surprisingly nice things was the consistency of being able to see over the generations that Dean Reese is still here!